Another black soccer player has been racially targeted by fans. 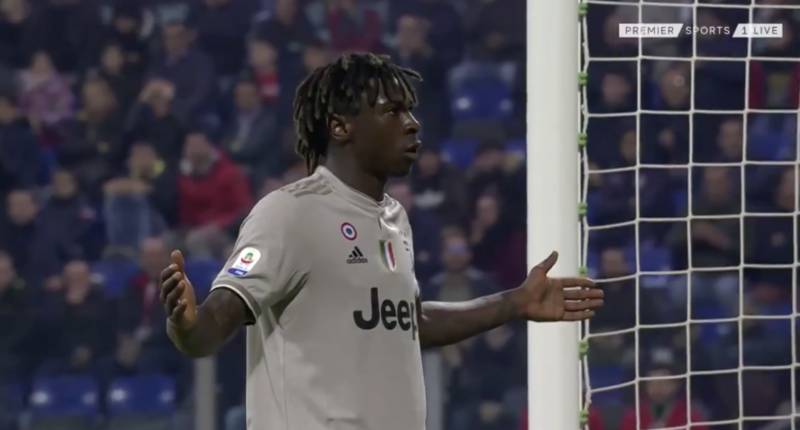 This time, it was 19-year-old Juventus striker Moise Kean, who along with teammates Blaise Matuidi and Alex Sandro was subjected to monkey noises from Cagliari fans. In the 85th minute of Tuesday’s game, Kean doubled Juve’s lead and celebrated by standing in front of the Cagliari fans with his hands stretched out. Some teammates went to Kean to get him away from the fans while Cagliari’s Luca Ceppitelli pleaded to his home fans to stop it. After the game, Kean didn’t get much support from his teammate Leonardo Bonucci and manager Maxi Allegri, who put half the blame on Kean. Bonucci tried to Instagram through it but didn’t accept responsibility for his comments. Eventually, after players such as Raheem Sterling, Memphis, Yaya Toure and the official Borussia Dortmund Twitter account took him to task, Bonucci made a statement clarifying his thoughts and condemning all forms of racism, even though he still didn’t take responsibility or apologize for what he said, not even offering the “I’m sorry if you were offended” non-apology. Allegri was at least more constructive in his ideas to ban the racists but also claimed Kean provoked them with his celebration. It should be noted that Kean scored toward the end of the game and his celebration was in response to the racist comments he received before that. “I didn’t hear anything from the stands, as I was focused on the game,” Allegri said. “You need great intelligence to deal with these situations and should not go to provoke people. That, of course, does not mean the idiots in the crowd and the way they reacted should be justified. Last week, England’s Callum Hudson-Odoi revealed he heard monkey sounds being made by Montenegro fans. Hudson-Odoi, Danny Rose and Raheem Sterling all acknowledged they heard racist fans in an international friendly against Montenegro. Sterling also spoke out against the British media, specifically the tabloids, about how they routinely treat black players worse than white players when writing similar stories. And then a few months ago, Napoli’s Kalidou Koulibaly was racially abused by Inter Milan fans even though the PA announcer told fans three times to refrain from making racist remarks. UEFA has a “No to Racism” campaign and FIFA had a “Say No to Racism” campaign but all they have done is raise awareness about making empty speeches before notable games in an effort to fool the public into thinking they actually give a damn about racism. To prove that, FIFA gave up the charade and disbanded their anti-racism campaign in 2016, saying their job was done. In the 1980s, hooliganism at English soccer games was rampant and in the 1985 European Cup Final between Liverpool and Juventus, 39 fans were crushed to death and hundreds were injured as a group of Liverpool fans charged at Juventus fans in a neutral section of Heysel Stadium on the Liverpool fan side, culminating in a wall collapsing. As a result, 14 Liverpool fans were convicted of manslaughter and served jail time and UEFA banned all English teams from European competition for five years, with Liverpool being banned an additional year. It was a stiff penalty that resulted in a lot of lost money and prestige, but it was the catalyst for English soccer to finally sit down and come up with measures to make sure hooliganism wouldn’t be as rampant. That doesn’t mean it’s completely out of the game, but it’s not as prevalent as it used to be. Maybe the same thing needs to happen in Italy. At some point UEFA is going to have to get tough. Making an example out of Italy by banning Italian clubs from European competitions for a few years would be a solid example. There are definitely other countries who could use a ban like this (Russia is at the top of the list) but it would be a huge statement to make, given the status of Serie A. Some, though, see this as a nuclear option; a nationwide ban from Champions League play could have reverberating effects for decades. In addition to losing hundreds of millions in TV revenue per year, world class stars probably won’t want to play in Italy if there’s no hope for Champions League action. As extreme a situation as that might be, when teams start losing out on hundreds of millions of dollars, people and organizations suddenly get a lot more motivated to change. As horrible as this sounds, Moise Kean is going to have to live with this. It’s easy for outsiders to say “If I was him, I wouldn’t play at Juventus if my manager and teammate won’t defend me” or “I’d punch Bonucci and Allegri” but those aren’t realistic responses when you’re the one in that situation. Kean is a 19-year-old playing for the best team in his native Italy, and a Champions League favorite as well. If he criticizes Leonardo Bonucci, someone who is older, more experienced, is a regular starter and is more successful for both for club and country than Kean at this point, Kean is the one getting sent to a new team. If there is one silver lining, it’s that Moise Kean is not alone. For every racist fan who made monkey chants or a player or manger who split the blame, there were more fans, players and managers spoke out in support of Kean and against the racists. Racism in soccer is getting worse, not better, and the governing bodies in charge are hopelessly naive in thinking it’s not a serious problem. If they truly cared, they would’ve stopped giving us the PR BS long ago and actually come up with real solutions.